We will explore the natural wonders and stunning views offered by the south coast as we head to a glacier that will set the scene for an exciting excursion. We will leave Reykjavík and head towards Hellisheidi, a mountain offering wonderful views of the large glacial valleys that are today fertile, cultivated areas stretching along the south coast of Iceland. We will pass through the town of Hveragerdi and admire its large greenhouses that benefit from the abundant geothermal energy in the area, a real blessing for the food and fruit and vegetable industry. Our journey will continue east past glaciers and expanses of snow until we catch sight of Hekla volcano, believed in the Middle Ages to be the "gateway to hell". It is a highly active volcano. The last eruption was as recent as the year 2000 and it is kept under close observation by geologists. In the distance we will spot the glacier that covers the caldera of Eyjafjallajökull, the volcano famous for stopping international air traffic for in 2010 due to its massive ash cloud emissions. We will soon reach the spectacular Seljalandsfoss waterfall where we will stop to take some unmissable photos. Then we will arrive at Mýrdalsjökull glacier where our guide will be waiting to take us on an unforgettable excursion over the snow and ice. We will find ourselves walking in an all-white world, one that is wild and rugged with ancient ice formations that paint a surreal picture. We will reach the wall of ice and show off our abilities climbing its steep sides. After the excursion, we will begin our return journey and stop at the wonderful Skógafoss waterfall, which puts on a majestic display in the midst of a green landscape. The break will allow us to eat a late lunch before we return to the ship. Participants will be provided with equipment for the excursion: hatchets, crampons and safety ropes to prevent falls even if guests lose their grip. We recommend wearing warm, comfortable clothes, a waterproof jacket, trousers (avoid jeans) and hiking boots. 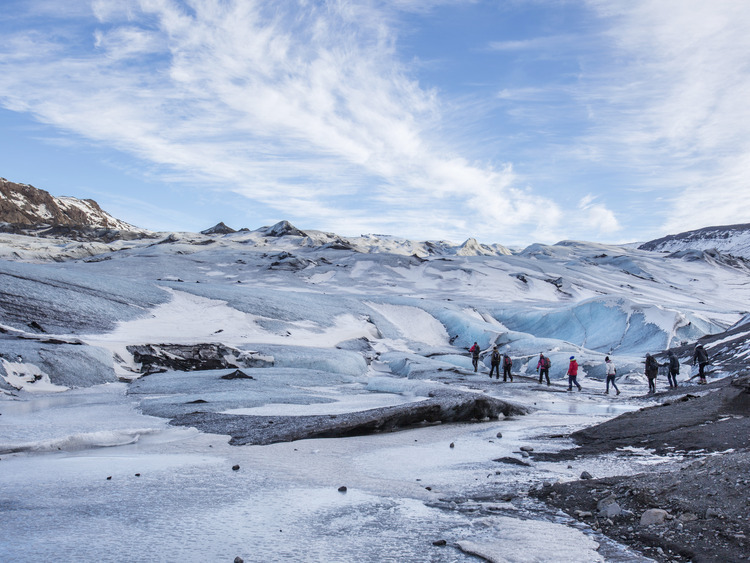 No prior experience is necessary but individual participants must accept liability for the glacier excursion. A liability release form will have to be completed, which specifies all the outdoor activities that involve risks.